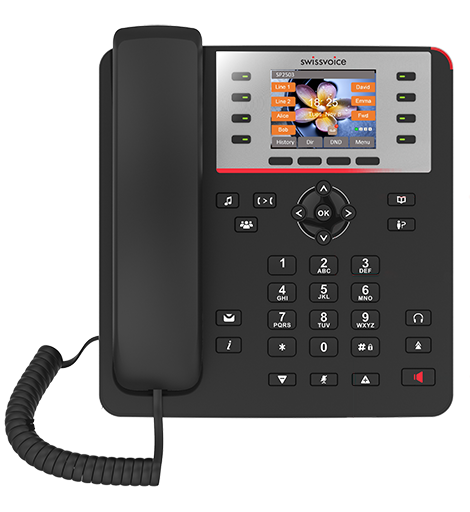 CP2503G is a powerful, user-friendly and customizable phone. Its HD color display, programmable paperless keys and Gigabit ports will boost your everyday efficiency. Make information clearer and simpler with the HD color screen. Enjoy a new way of communication. CP2503G is fitted with 8 programmable paperless self-labelled keys with tricolor backlight (up to 28 virtual keys). Just press the corresponding key to reach the pre-set line, contact or feature. As simple as a click. Make the most out of your network with the two Ethernet Gigabit ports and benefit from empowered performances.